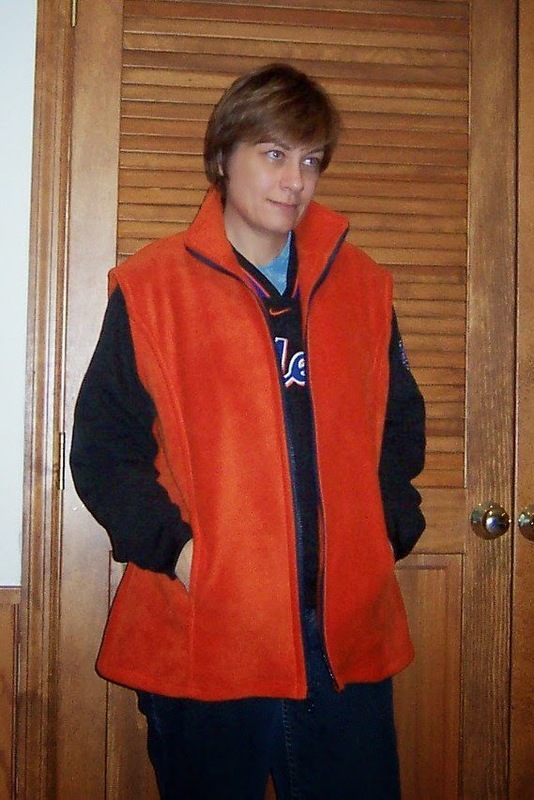 McCall's 3402 - Fleece Vest : Ready for the Post Season! 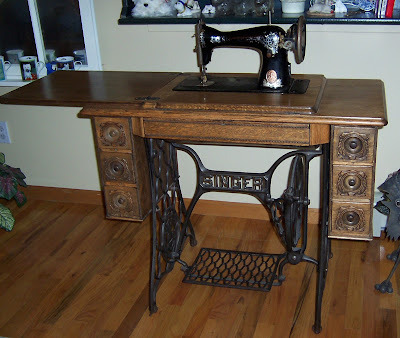 After I finished sewing two blouses this month, my plan was to continue with blouses and tops until I had figured out how to get the alterations done correctly and sew a sleeve perfectly. 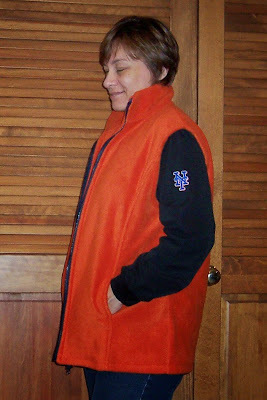 McCall's 3402 - I actually used this pattern to make the hats from last year; I had intentions of making an orange fleece vest to wear to the World Series, but the NLCS Game 7 put an end to that notion. When I finally took out the pattern and started reading the sizing information, my first thought was, uh-oh another pattern that's too big for me. 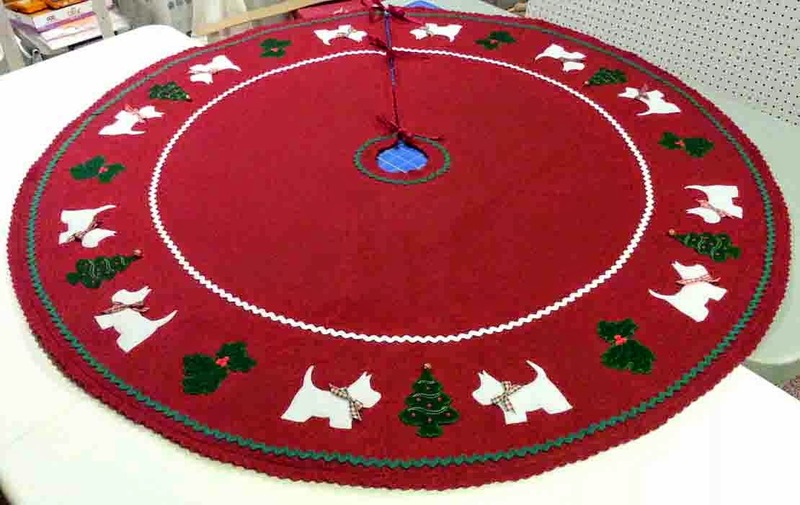 This is a multi-sized unisex pattern and I had purchased the size grouping for small-medium-large. Based on my measurements, and the finished size at the chest (about 10 inches larger than me! ), I thought I might be closer to an extra-small (which, of course, isn't even one of the options). I also thought this pattern was a little slouchy and that maybe I should have selected something more fitted. So I quickly stitched up a muslin version, just to see how big it would really turn out to be. I didn't bother with facings or the collar for the muslin version, just the front and back sections, so I could get an idea . 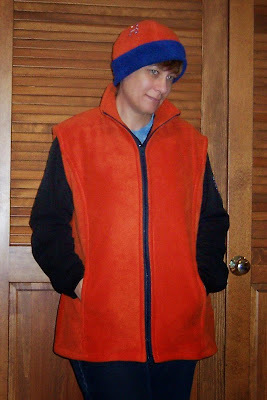 . . when I was done stitching, I put on a couple of layers of sweaters to simulate the extra "padding" I'd probably be wearing under this vest. And the size small wasn't so big after all. In fact, I decided I needed to add a few extra inches to the hip area. The directions for this pattern were pretty easy to follow. I was able to put the pockets in without too much trouble. One thing I think I would change the order of would be to topstitch the front of the pocket before sewing the front to the side front; it's a little hard to topstitch the front of the pocket after that seam is sewn. The zipper went in quite easily. I've never done this type of separating zipper before, but now that I have done one, I'd like to try more. And I think I'm getting better at putting in collars; this one turned out just about perfect. I don't think I would stitch this pattern again, only because I'd prefer a different style. I sewed all the seams using my sewing machine and the dual feed foot (walking foot), then I used the serger and a 3-thread overlock stitch and orange woolly nylon thread to clean-finish the seams and raw edges. I had just enough fleece to make this vest; I used a remnant of blue apparel lining for the pocket lining and I had the blue zipper in my stash from a previous project that never was started. Of course, I had to model it layered over my Mets windshirt! The shoulders are a little big, but that's how the pattern picture looks; I did take off about one inch extra when hemming the shoulder to make it more proportional to my shape. I finished this vest Friday night, while watching the Mets lose to the Phillies . . . and they've lost every game since. So I'm taking the blame for the streak -- it's all because I started counting on a post-season before they ever won the division. There's one last Sunday home game on September 30 . . . let's hope they're still in the race by then. And, if not, at least I'll be warm at that game.